The Five Guys menu of hamburgers, kosher-style hot dogs, vegetable sandwiches, and grilled cheese sandwiches are widely considered among the best in the country. Aside from the on-menu food items, you can also order these five items on the Five Guys secret menu, meaning the patties, hotdogs and vegetables are served on sweeter buns. 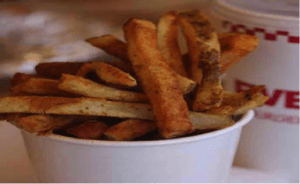 Even the fresh-cut French fries, which are the only side item available, are distinguished from the competitors since these are seasoned in two ways, namely, Cajun and Five Guys style. But a word of warning: If you have an allergy to peanuts, including peanut oil, then you should avoid the Five Guys restaurants, as they fry everything in peanut oil and serve customers bowls of roasted peanuts while they wait for their meal. For dessert, you can choose from more than 20 flavors of milkshakes. You can even mix and match several flavors in your customized milkshake, not to mention that you can also add bacon bits to it. Talk about milkshake heaven! The Five Guys’ fresh-cut French fries are already treats on their own, thanks to their crunchy texture and delicious flavor. Add melted cheese to the mix and you have an explosion of flavor with each bite – the crunchy texture contrasts with the soft gooey texture of the melted cheese. You will want to finish the mountain of fries before even biting into your burger. 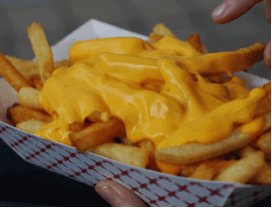 Cheese fries go for as little as 50 cents extra per although you may also be lucky and get them for free. How cool is that? Five Guys restaurants take pride in their non-soggy French Fries, too. The crunchy texture comes from the fresh-cut French fries being fried twice – yes, twice – in peanut oil. You can go one step further in your quest for extra-crispy fries by requesting for them to be well done, like the steak. Just make sure to take out these French fries out of their cup to maintain their crispiness while you dig in. You have thousands of options for customizing your burger, whether you are an all-meat type, a vegetarian, or somewhere in between. Even President Barack Obama had his own customized Five Guys burger visited one of its restaurants. His order: A zesty combination of a regular cheeseburger with the addition of tomato, lettuce, jalapeno peppers, and pickles with mustard on top. You can also add the A-1 sauce, sautéed onions, and onion rings for even more flavor – why not? After all, Five Guys makes hamburgers worthy of the president. Are you a vegetarian, but want to try a Five Guys burger? 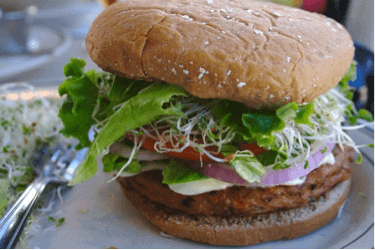 Order the veggie burger, which is a combination of the regular burger topping options on a Five Guys bun as well as your choice of vegetable fillings. Ask your server about the available vegetable fixings so that you can adjust as desired. You can go straight to food heaven and back with Five Guys’ patty melt. Think about it: A Five Guys’ juicy beef patty with its tender texture and savory flavor mashed between two grilled slices of bread with butter at the core of their extra goodness. Add grilled onions and melted cheese, and you have a patty melt that, as Olaf says it, is worth melting for. You can have two or more patties in your order, add more toppings, or ask for more melted cheese. Throw well-done fries into your order and you have the crispiness of the fries contrasting nicely with the soft and savory texture of the patty melt. What’s a trip to the restaurant chain if someone in your group does not order the not-so-secret item on the Five Guys secret menu – the double grilled cheeseburger? This is your best choice when you want to go over the top. Instead of the regular grilled cheese toppings, you will get two – yes, two – separate grilled sandwiches sandwiched into a single serving – or perhaps, to share if you really like the person you came with. Bring in the guys and the girls to a Five Guys restaurant and start enjoying these secret menu options. I CAN NOT FEED MY FAMILY AT YOUR STORE,YOUR PRICES ARE TO MUCH.I HAD YOUR FOOD BEFORE WHEN IT WAS JUST ME LOOKING FOR SOMETHING DIFFERENT TO ENJOY.I WAS ON LUANCH AND SAW YOUR PLACE,SO I STOPED IN AND WAS AMAZE BY THE COST.BUT I HAD LUANCH ANT WAY.MY KIDS WILL NOT GET THE CHANCE TO PARTACKE OF YOUR FOOD THIS YEAR ITS WILL MAKE ME CRY.THE FOOD IS GOOD. Learn how to capitalize and punctuate your sentence correctly and Five Guys can be a lot of money, not alot. Really? I hope you are kid messing around because if you’re not than read your comment again, it’s obvious why you don’t have a job high paying enough to purchase a fast food cheese burger (an excellent one). Learn how to speak English, learn how to spell and apply for a higher paying job. Probably an NBA professional basketball player or NFL player who went through college and can’t speak plain English or spell. Many public school systems and colleges are not doing their jobs. Yes, prices may be a little higher than SOME fast food, BUT look what you are getting. Fresh patties and those WONDERFUL boardwalk fries. I lived in VA to eat at the first Five Guys, and WOW what a wonderful experience. I am so glad to see that Five Guys has expanded so that everyone can experience these GREAT foods. THE EXPERIENCE is worth it. KEEP UP THE GREAT WORK FIVE GUYS!!!!!!! My God what a bunch of asses! This website is for you to comment on food…and there you go dissing someone about their usage of the English language. Friggin’ slobs. Now that being said, the reason I love Five Guys is that at my city’s Five Guys, they are so courteous; and when you leave the store they will put a few napkins on the top of your order and throw hot fries on top just for you to eat on the way home! Now THAT is cool! And I certainly don’t mind paying a bit more for good food and great service. Rock on, Five Dudes! First and last time I ate here, bit into a piece of bone shard? in my cheeseburger, lost my appetite and never ate here again. It is only ground beef people it does not matter if it comes from Burger King or Five Guys ground meat is ground meat it is too expensive. I guess people found some bad things to say about this place. Not surprising. Well, just a few words to say. Some say it’s pretty overpriced, and you’re right, it’s more expensive than your average fast food restaurant. But that’s becuase it’s not your average fast food restaurant. They make the food right in front of you, yelling the orders to their coworkers and chefs(you’ll know when you get in), and it’s obvious they have passion in it. I’m burger enthusiast and the burgers here are amazing. The meat is cooked really well. If you like fries…my god. Always get the small. They give you A LOT of fries lol. You know AMC’s large popcorn bucket? Yeah, that’s the small. It’s no Checkers seasoned fries, but it gets the job done. The burger and the fries themselves cost like $13. The amount of food they give you and the quality your getting is really worth it. This is not a place where you go get some reward for dieting a month or two, let’s make that clear now. This one place will destroy years of hard work. But if you want good fries, good burgers, or some good in general, with the only intent in your head being “man, I want some REAL food”, this is a high quality country fast food restaurant that will not disappoint. I thought the food is over priced. I would rather shove a pencil in my eye then pay 9 dollars for a mediocre burger and a brown sack of greasy fries. I will not per take again and may god have mercy on your soul. I am with you….you can eat a wonderful buffet for the same price and get much more quality food for your money. Gotta love “Schmoyho”, huh? Ha, ha! Five Guys is the worst! They gave me a botched up grilled cheese sandwich and it cost to much. I am never going again. I want to try this place but they have no chili or slaw for their hot dogs and hamburgers. Where are these people from ? I can’t imagine a hot dog without chili and slaw. I may still give it a try one time. I asked them to hold the salt on the fries, and although they were turning out new batches of fries one right after the other, I was told that they couldn’t do that. So much for Five Guys. On the expensive side for what you get. Like the peanuts, wonder what that is all about?? burgers are pretty good. the rest of the stuff is overpriced. 5$ for large fries? 2.29 for a regular drink? could get the same at mcdonals for 2$ and 3$. If i go again I would only order a burger. 15$ for fast food for one person is a bit on the expensive side. Agreed and I only have them when I get into the area. Which isn’t often. I would have commented earlier but I couldn’t do the security math problem! Wtf, why make me do math to post here, like 10×5 how the he’ll am I supposed to know. Couldn’t find a calculator so I called my mom. Anyway, burgers are good, fries are great. Maybe you should of learned something in school, and maybe just maybe, if your to dumb to know what 10×5 is your opinion on anything doesnt matter please keep from breeding and do the universe a favor. I disagree about the price compared to McDonald’s because these are SO MUCH BETTER than McDonald’s. They taste and look like a real hamburger. The other thing is the portions for the fries are huge! Totally unnecessary to order large fries or large burger for that matter. I always get the “little” burger and there’s nothing little about it. Plus you can get ten toppings if you want and it’s not extra. Yum! The people that say its more expensive than McDonalds please go eat some more paint chips, the size of there fries are 2 to 3 times bigger than McDonald’s and are way better quality. To the people that say its to expensive please tell me how? Yes you can make some burgers at home cheaper but its cheaper for me and my old lady to go to five guys than Wendy’s or nasty McDonald’s.. Please stop smooshing the juices out of the burger qfter the flip. Here’s how to do it. Meat ball on grill, in the first sseconds, smoosh onto the flat top. Let cook for as long as necessary, most of the cooking should be done on the first side. Flip…add spices…..then, leave it ALONE! When cooked through, pull. Dress. Enjoy. The food was very good. But for two people it cost $33. It wasn’t THAT good. I could have gotten a burger at a sit down restaurant for half the price. Won’t go back. Food is delicious & WORTH the extra price. Comparing Five Guys to McDonalds or another fast food place is like comparing apples to shoe strings! One little burger & a small fry should be plenty enough for one adult, even in this “American’s are major over eaters” day & age. Two little burgers & a regular fry is should be plenty for two adults – a regular fry is literally half a paper BAG full (not the little serving cups from other joints). One large fry & little burger for each should be plenty to feed up to a family of 3 or 4. The quality is superior to typical fast food places (McDonalds, Hardees, etc.) and you can choose from just about any topping you can imagine for no additional cost. The beef is real & the fries are cut fresh that day, not frozen. Yes you’re going to spend more than going to McDonalds but you get what you pay for. If you’re that tight or that cheap then I’m sure there’s a dollar menu for just down the road, just don’t expect it to taste anything like Five Guys.